Sr Monique often sang this refrain during the course of the Advent liturgies in our little chapel at Notre-Dame in Port-Vila. And Jesus came to take her, to the surprise of everyone, on Sunday December 28th 2008 at 6:00pm. Sr Monique, who was working in Vao, Mallicolo, had been with us for nearly three months. In fact, at the beginning of December, she fell and fractured her right wrist. She came to Port Vila and was in a plaster cast for two and a half months. Actually, everything was going well, and her hand was getting better. 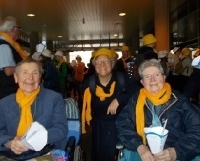 Not being able to work, which cost her enormously, she spent a long time in prayer, and moved around making plans: the retreat with the Sisters at the beginning of January, a trip to Vao in mid-January to get her things in view of the planned trip to Rome for the Marist month and the holiday with her family in France. But the unexpected happened. On Saturday the 27th, Monique had a little fever, but no other symptoms. On Sunday morning, the fever had risen, and by the end of the morning she had difficulty breathing. “I am not well”, she said. The doctor came, but the treatment did not help and it was decided to take her to the hospital. At the hospital her state quickly became very grave: severe bronchial-pneumonia with septic shock. She was given oxygen, was no longer talking and little by little seemed to fall into unconsciousness. In spite of the care, she died peacefully at 6:00 pm. 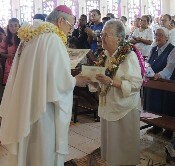 Sr Monique GIRARD was born on September 16, 1932 in Maisdon-sur-Sèvre in Loire Atlantic, France. At the death of her mother, she was the one to take care of her brothers and sisters. In September 1956, she entered the SMSM Postulate at Sainte-Foy-lès-Lyon and made her religious profession on March 9 1959. After several years of studies to become a teacher, she was named for New Hebrides and arrived at Port-Vila on January 29th 1963. 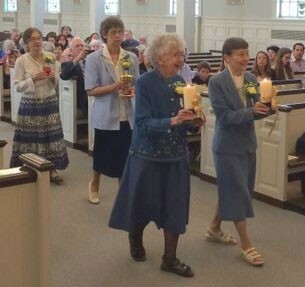 It was at St Joan of Arc School that she began her teaching, and remained there 6 years. Then it was St Michel at Santo. In 1973, she made her second novitiate in France. On her return, she was appointed to Port-Orly, Santo until her next holiday in France in December 1980 which was prolonged in New Caledonia in order to prepare the CAP in education. In February 1982, she was assigned to Olal, Ambrym then to St-Michel, Santo and then Lamap in Mallicolo. In 1985, she did religious studies at Lumen Vitae in Belgium. 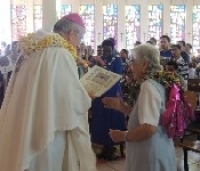 She returned in 1986 and lived in the community of Foyer Nabanga at Port-Vila where she took charge of the catechesis and visited the diocesan schools for a dozen years. From 1996, she was by turns at St Michel, at Lamap and since 2000, at Vao, Mallicolo where she lived alone these last three years. 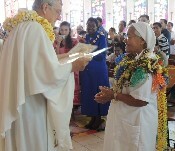 From Vao she returned regularly to St Michel, the community to which she was attached, to meet with the sisters in temporary vows for ongoing formation. Formation that they always appreciated. 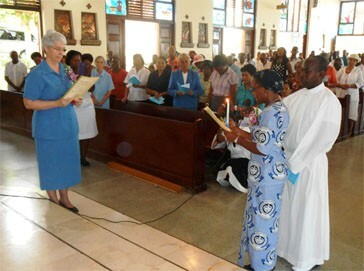 In all her apostolic activities, as teacher, directress of a school, or directress of religious education, Sr Monique was concerned to help the teachers prepare the catechesis and liturgies well. The Word of God was very important in the formation that she gave. When she no longer had professional responsibilities, she worked with the women in sewing, cooking and care of the sacristy linen, and helped the teachers with catechesis. She never lacked ideas and knew how to insist on the things she wanted for the mission. She was also a support for the young priest of the parish. The fracture of her wrist was a trial, having nothing to do was unbearable. The Lord was preparing her to leave everything and enter His Kingdom. Every day, Monique ended the Office with this blessing taken from the book of Numbers: 6, 24-26. May the Lord let His face shine upon you and be gracious to you! Rest in Peace, Monique and pray for us and for all those you have left. May Mary, to whom you loved to pray and to whom you invited others to pray, welcome you to be with her.